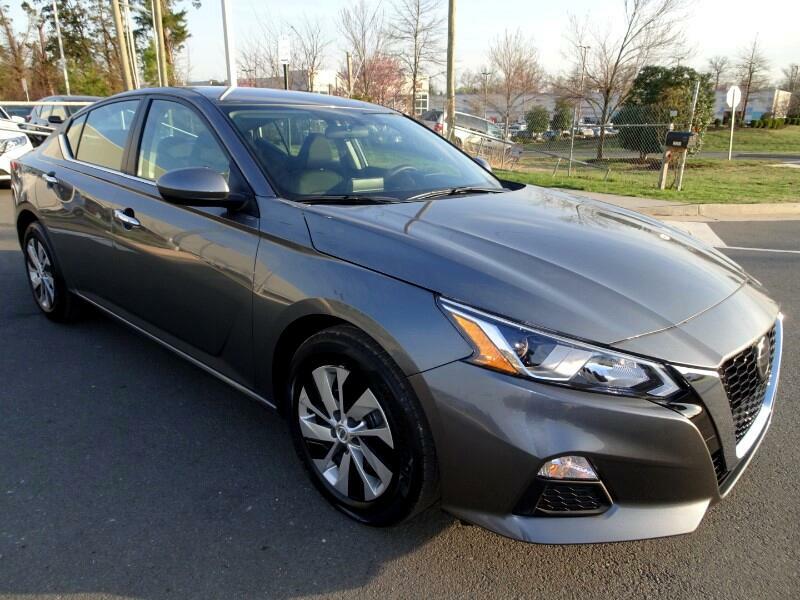 THIS IS A 2019 NISSAN ALTIMA 2.5 S FWD, GUN METALLIC ON CHARCOAL CLOTH SEAT'S, ONLY !!!2,960!!! MILE'S, 1 OWNER, 4-wheel ABS Brakes, ABS and Driveline Traction Control, Anti-theft alarm system, Audio controls on steering wheel, Auxiliary engine cooler, Bluetooth wireless phone connectivity, Cruise controls on steering wheel, Daytime running lights, Digital Audio Input, Driver and passenger heated-cushion, driver and passenger heated-seatback, Driver and passenger knee airbags, Dual front, Dual illuminated vanity mirrors, Electro chromatic rearview mirror, External temperature display, Fold forward seatback rear seats, Front and rear reading lights, Front Ventilated disc brakes, Fuel Consumption: City: 28 mpg, Fuel Consumption: Highway: 39 mpg, Interior air filtration, Manufacturer's 0-60mph acceleration time (seconds): 7.7 s, Metal-look door trim, Metal-look/piano black dash trim, Nissan Connect, Passenger Airbag, Power remote driver mirror adjustment, Power remote passenger mirror adjustment, Power remote trunk release, Power windows, Privacy glass: Light, Radio Data System, Rear bench, Rear seats center armrest, Remote power door locks, Remote window operation, Side airbag, Sirius XM AM/FM/HD/Satellite Radio, Speed Sensitive Audio Volume Control, Speed-proportional power steering, Stability control, Surround Audio, Suspension class: Regular, Tachometer, Tilt and telescopic steering wheel, Total Number of Speakers: 9, Transmission gear shifting controls on steering wheel, Trip computer, 4-Wheel Disc Brakes, ABS Brakes, Air Conditioning, Auto High-Beam Headlights, Automatic Temperature Control, Bumpers: Body-Color, Delay-Off Headlights, Distance Pacing Cruise Control: Intelligent Cruise Control (Icc) W/Full Speed Range & Hold, Driver Door Bin, Driver Vanity Mirror, Dual Front Impact Airbags, Dual Front Side Impact Airbags, Electronic Stability Control, Four Wheel Independent Suspension, Front Anti-Roll Bar, Front Beverage Holders, Front Bucket Seats, Front Center Armrest W/Storage, Front Dual Zone A/C, Front Reading Lights, Fully Automatic Headlights, Garage Door Transmitter: Home link, Heated Door Mirrors, Illuminated Entry, Knee Airbag, Leather Shift Knob, Low Tire Pressure Warning, Occupant Sensing Airbag, Outside Temperature Display, Overhead Airbag, Overhead Console, Panic Alarm, Passenger Door Bin, Passenger Vanity Mirror, Power Door Mirrors, Power Driver Seat, Power Steering, Rear Anti-Roll Bar, Rear Reading Lights, Rear Seat Center Armrest, Rear Side Impact Airbag, Rear Window Defroster, Remote Keyless Entry, Security System, Speed Control, Speed-Sensing Steering, Split Folding Rear Seat, Steering Wheel Mounted Audio Controls, Telescoping Steering Wheel, Tilt Steering Wheel, Traction Control, Turn Signal Indicator Mirrors, Variably Intermittent Wipers, and more!!! DON'T MISS OUT ON THIS GREAT DEAL!! !